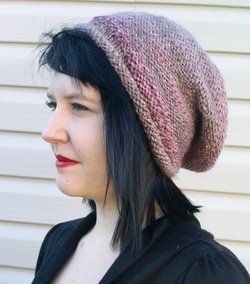 Slouchie hat in colourway "raspberry truffle" made from 2- ply blue faced leicester wool and cashmere. 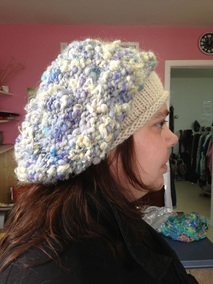 "Forest glade" colourway in a single ply blue faced leicester slouchie hat. 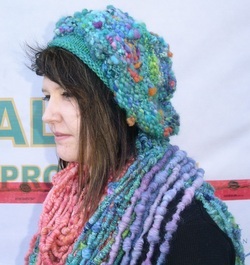 Merino and mohair are blended into a single, then plyed with a novelty eyelash yarn. Just for my Twilight friends. Brim is llama and corriedale in a natural colour. Crown is cream mohair and llama and pale lavender rambouillet with hits of bright blue silk and yak. 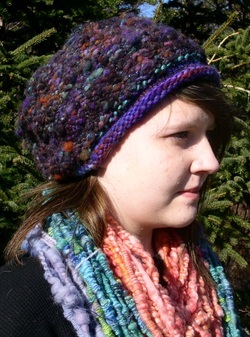 The brim on this Lumpy Llama is targhee - an especially springy wool - in purple, orange and aqua. 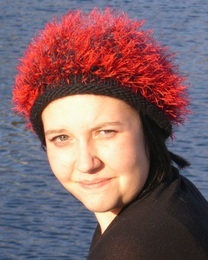 The crown is llama and mohair in dark reds, blues and purples together with purple rambouillet. Silk and yak in aqua are added highlights and the whole length is plied with turquoise mercerised cotton for shine. Body of the hat is assorted wools including dorset, merino and rambouillet with silk, mohair, llama and a good dose of orange yak. 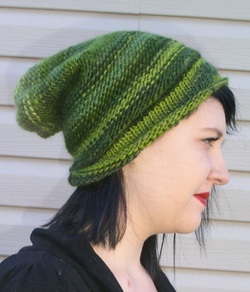 Brim is a 2-ply silk-merino. 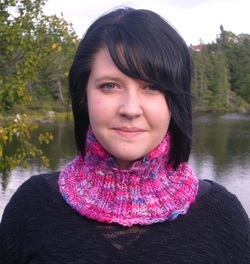 Cupids Cowl is a neckwarmer, to keep you warm when the wind blows without the bother of long scarf-tails to manage! When it is really cold, revrse the cowl and put the split at the back; the rest will cover your face. Knit here is single ply BFL in colourway "passion". 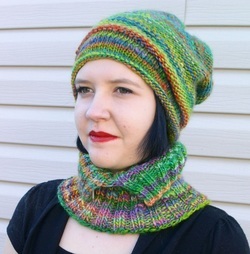 Slouchie hat and matching cowl in colourway "green rainbow" in a single ply pure wool - blue faced leicester.